The couple met in November 2010, through a mutual friend, during Thanksgiving festivities. The couple were friends at first and found many similarities together, and their friendship eventually turned into a relationship. Omar jokes that Tonya proposed to him, but really, in the fall of 2017, Omar got permission from her family to propose. With their help, he proposed at the very spot where she gave him their first hug on their first date, and her sister was there to capture it all on film. Omar brought up the idea of a destination wedding and Tonya ran with it, diving headfirst into research. 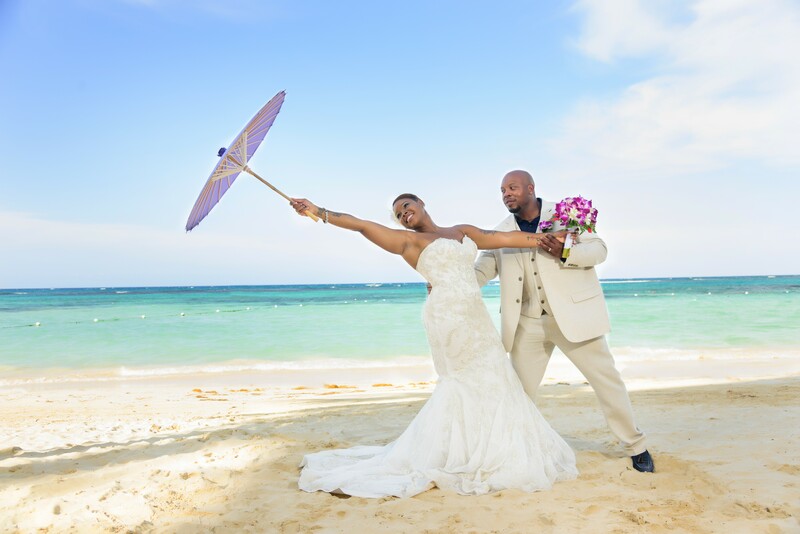 They loved the idea of a beach wedding and having their first true vacation together. It also served the dual purpose of being the best place to unite both families, and Omar planned for his father to be his best man. Once they saw how affordable it really was, they went for it. They knew they needed a family-friendly resort and liked the idea of Jamaica, so they chose the RIU Ocho Rios with their Destify agent Ann. While working with the wedding department they enjoyed how seamless the process was. They were professional and laid back throughout, Omar said, “Everyone was so helpful”. In the morning on the day of the wedding, Tonya kicked Omar out of the hotel room so she could have the morning to herself to get ready. Their ceremony was actually Omar’s birthday, and Tonya surprised him with some special birthday gifts. They held a 3pm beach ceremony, with the ocean as the background. Immediately after there was the cocktail reception, and even fruit punch mocktails for the kids. After, they lucked out with a private reception at one of RIU’s signature restaurants, as another wedding was canceled that day and they got the entire restaurant to themselves. After the reception ended at 8:30 many of the guests met up to enjoy the nightly entertainment and to hit the resort’s nightclub while the couple went back to the room to enjoy their first night as newlyweds. The couples’ advice is to be patient. The day will come, so do your best not to become anxious on the days up to your wedding. After a year of planning, everything worked out perfectly. Enjoy the process and enjoy the moment, because it’s well worth it in the end.